Tired of hamburgers? 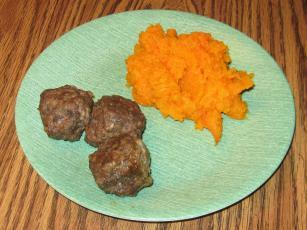 Next time roll the hamburger into balls with this easy meatball recipe. Mix and roll into balls. Fry in fry pan. This amount just fits in our large fry pan. Try making a batch to go with your favorite spaghetti or lasagna. This recipe actually comes from a long-time Italian friend of my mom's. Just drop them in your sauce and heat through...yummy!